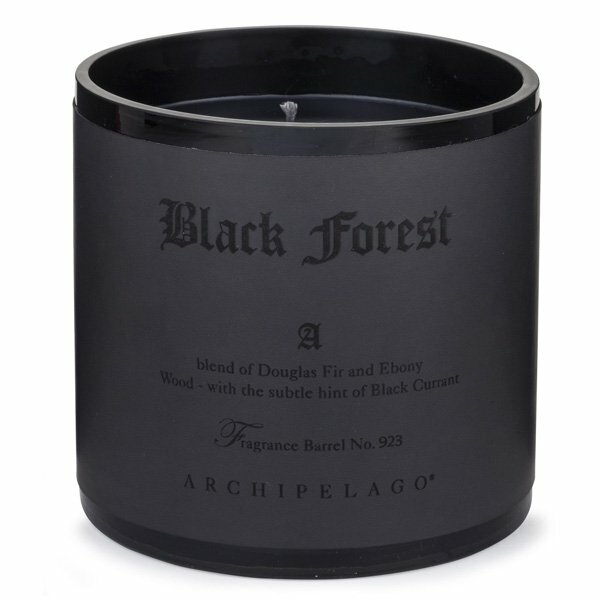 Archipelago Black Forest XL 3-Wick Candle is a warm and sultry blend of Black Currants, Ebony Wood, and Douglas Fir. Hand-poured into an elegant black glass jar with a hand-tooled letterpress wrap, this candle makes a beautiful addition to your home decor. Archipelago's Black Forest Home Fragrance Collection is best described by one word: intoxicating! Rapidly becoming a must have celebrity favorite, this luxurious scent contains aromatherapy essential oils, wrapped in a sultry blend of black currant, ebony wood and douglas fir. Set the perfect mood or fill any room with this luxurious, decorative and dramatic scent. Bring home a Black Forest Soy Scented Candle today!